Also known as Sticky Tube Weed. Description: Mucilaginous but firm, to 350 mm long and 5 mm wide. Arising from a crustose, expanded base probably producing erect axes repeatedly. Major branching irregularly alternate, generally with a shorter opposite branch, becoming pyramidal in outline. Branches narrowing gradually at both ends. Ultimate branches noticeably banded. Plants monoecious, forming sunken but swollen cystocarps. Tetrasporangia formed on crustose plants; terminal, obliquely or irregularly cruciately divided. Habitat: Growing or rock in pools in the lower intertidal and in the subtidal to 5 m. Generally occurring between April and August, but occasionally found at other times. Distribution: Widely distributed in the NE Atlantic from Norway and Sweden south to Spain and Portugal. Said to have a south-western distribution in Britain and Ireland, but is widely distributed, if sporadic and genuinely rare. Also known from the N Pacific. Records elsewhere require reassessment. 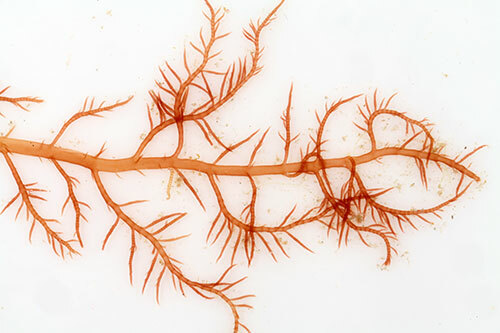 Similar species: Lomentaria clavellosa which is less mucilaginous, regularly pinnately branched, is generally compressed, and does not have banded laterals. Site © M.D. Guiry 2000 - 2019. Important copyright notice: all text, design and photographs on this site are copyrighted by M.D. Guiry unless otherwise stated and all rights are strictly reserved. Click here for copyright information and contact. Website design: 249 Design Studio. Site maintained by M.D. Guiry (michael.guiry@nuigalway.ie). There have been 8736770 page loads since 1 January 2014 on 25 April 2019.